There are several national and international organizations that establish and/or maintain standards for the olive oil industry. Organizations include: International Olive Council (IOC), Australian Olive Association (AOA), the North American Olive Oil Association (NAOOA), Canada Food Inspection Agency (CFIA), and United States Department of Agriculture (USDA). In recent years, there have been several investigations conducted on adherence to these standards. Well-known Italian olive oil producers have been found guilty of importing lesser-quality olive oil from North Africa and then relabelling and pricing it as a high-quality extra-virgin Italian product. A study done by the University of California, Davis found that, among the five top-selling imported ‘extra-virgin’ brands sold in the United States, 73% of the samples were found to have failed the IOC sensory standards. In Canada, several importers have been fined for blending small amounts of extra-virgin oil with much cheaper refined olive oil and, in some cases, vegetable oil and then selling it as extra-virgin olive oil. If you are interested in learning more about the olive oil industry and, in particular, about olive oil fraud, please see Tom Mueller’s book “Extra Virginity”. Also see – the New York Times’ Extra-Virgin Suicide: The Adulteration of Italian Olive-Oil. The organizations determine the various chemical and taste (also called ‘sensory’ or ‘organoleptic’) standards for olive oils, which are tested in independent labs. The olive oil must meet 30 chemical tests in order to be classified as “extra-virgin” under EU law. Beyond the chemical testing, sensory tests must also be passed by an IOC-certified panel. An oil’s results on these two sets of tests determine the grade into which it is classified. “Extra-virgin” is at the top of the list. Here are the oil grades used by the IOC, in descending order of quality. Here are a few attributes for which chemical tests are done. Polyphenols – An oil’s polyphenol content contributes significantly to its antioxidant properties. It is therefore an important indicator of a range of health-giving characteristics, taste qualities, and shelf life (polyphenols work to preserve the oil as well as the bodies of those who consume it). The IOC recently approved a method of measuring an oil’s polyphenol content, and this indicator is becoming increasingly common on olive oil labels. PPP (Pyropheophytins) – Olive oil contains chlorophyll. The chlorophyll breaks down naturally over time into pheophytin and then pyropheophytins. The ratio of pyropheophytins to pheophytins conveys information about the oil, in particular, whether it has been refined, deodorized, or aged. FFA (Free Fatty Acids) – High levels of free fatty acids indicate hydrolyzed, oxidized, and/or poor quality oil. DAG (Diacylglycerols) – Low levels of DAGs identify oils that are hydrolyzed, of poor quality, and/or adulterated with refined oil. DAGs decrease with time, so their levels are one indication of the oil’s freshness. UV (Ultraviolet Absorption) – This test provides an insight into the quality of the oil, its state of preservation, and changes brought about by processing. PV (Peroxide Value) – Elevated peroxide levels indicate oxidized or poor-quality oil. These are six of the 30 chemical tests. Producers who submit their oil for testing in respected labs are clearly committed to offering only the highest-quality olive oil to the consumer. Organoleptic testing is conducted by certified tasting panels, normally consisting of eight members, who will sample olive oils to identify positive taste characteristics and to check for “faults”, i.e., negative characteristics. According to EU regulations, extra-virgin olive oil must have appreciable levels of pepperiness, bitterness, and fruitiness, and must be free of 16 official taste faults, such as burnt, rancid, metallic, and sour. Several of the tests concern the age of the oil, and for good reason. Olives are stone fruits, like cherries and plums. So real extra-virgin olive oil is actually fresh-squeezed fruit juice – seasonal, perishable, and never better than in the first few weeks after it is milled. Bitterness and pungency are usually positive indicators of the healthfulness of oil. Sweetness and butteriness are often not. The flavour and aroma of extra-virgin olive oil, like all natural fruit juices, begins to deteriorate within a few months of milling. This decline accelerates when the oil is bottled, and accelerates further when the bottle is opened. To get the freshest oil, our supplier buys directly from artisan mills throughout the Mediterranean, Australia, South Africa, South America, and the U.S. They buy only the latest seasonal crush, immediately after the oil is milled. This product is then tested and shipped immediately to retail outlets, providing the consumer with the freshest extra-virgin olive oil available. At Frescolio, all of our oils have passed this battery of tests. In the store, chemical and organoleptic testing results are posted by each of our varietal olive oils. 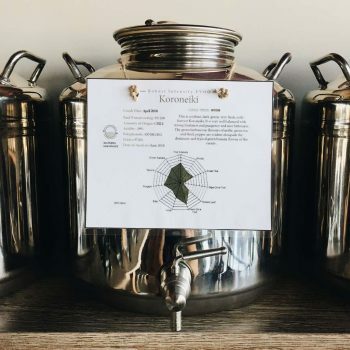 We’re certain that, with this information and the ability to taste the oil before deciding whether to buy, you will be able to make an informed choice.